The parable 6 Blind men and the Elephant originated on the ancient Indian subcontinent and has been told in differing versions, over time. In the 19th Century, American poet John Godfrey Saxe wrote a poem in which he presented the elephant in the story as a representation God. This version has been since repeated in children’s books, other literature, and can often be heard in our universities to promote a pluralistic view of religion. Here is a paraphrased version of 6 Blind Men and the Elephant. 6 Blind Men touch an elephant in order to understand what it is like. Whether used in religious application implying that all religions have some piece of the truth in that all lead to God or the more skeptical view that no truth can be found because it’s wrapped in cultural bias, this parable runs into major challenges. In fact, to position it as a viewpoint that all religions have some equal but differing partial truth is self-defeating. Here are a few questions that could be positioned to expose some of the weaknesses in associating this parable with religion. 1) What if the elephant could speak? The Parable glosses over a major viewpoint of the Abrahamic religions of Christianity, Judaism, and Islam. These belief systems are the 3 largest in the world. All make the claim that God is not mute but speaks to His people! “The claim of Christianity is that man doesn’t learn about God by groping. Instead, discovery is through God’s own self-disclosure. He is not passive and silent, leaving us to guess about His nature. God tells us what He is like and what He wants. 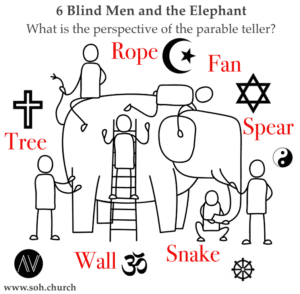 The 6 Blind Men and the Elephant doesn’t account for a God that wants you to know who He is. Even if the men couldn’t see, if the elephant (God) could speak and have the desire to reveal himself to them, they could know the truth. 2) What about the law of non-contradiction? The law of non-contradiction, which is widely accepted in classical logic states that contradictory statements cannot be true in the same sense at the same time. “A is B” and “A is not B” cannot coexist as both being true. “The elephant is so small it fits in my pocket.” and “The elephant is as big as a house.” could not both be true. Christianity says Jesus is the Messiah and God in the flesh. Judaism says He was not the Messiah and Islam says He was just a prophet. The 3 do not have the convenience of all being true just by the law of non-contradiction alone. These are irreconcilable differences that thwart the “all roads lead to God” philosophy. The final question we will examine is explained quite well by Apologist Frank Turek. He often recommends examining an important question pertaining to 6 Blind Men and the Elephant. 3) What is the perspective of the parable teller? This is where the parable really collapses on itself in the context of religion. The parable teller has the advantage of not being blind. This means he possesses something that the parable claims can’t be true. That is the ability to have the vantage point of absolute truth. He can see all. Isn’t that convenient? The religious pluralist and skeptic get to say that everyone else is blind but themselves. This is either radically arrogant or unknowingly self-defeating. Jesus Himself stated that He came so that the blind shall see. (John 9) He, of course, meant this both physically and spiritually. Consider these points. If God can make the blind see, each of these men can then come to the correct conclusion and refute the claims that it’s a tree, rope, spear, etc. They can clearly see it’s an elephant. – We can see God for Who He is! Truth is not relative. If it were we would not know the men were wrong. – Absolute truth exists and it is available to those who seek it. You cannot claim something is wrong unless you know what is right. – There is a divine standard that we can weigh everything against to discern right from wrong. 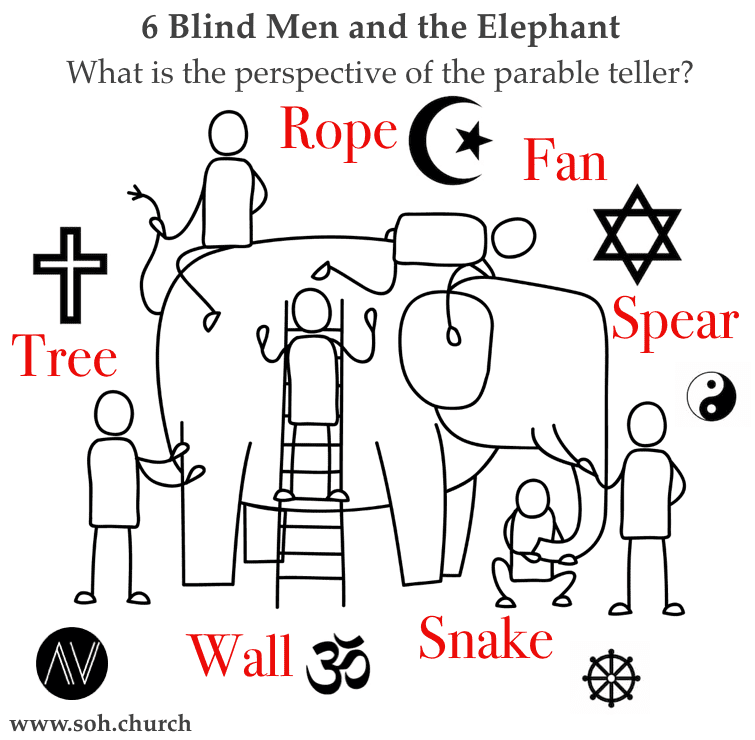 The 6 men and the elephant parable implodes by proving the exact opposite point intended by religious pluralist and academic skeptics. Since absolute truth exists and it is possible to have a vantage point to see it, all it takes is removing blindfolds, seeing it and accepting it. The Gospel of Jesus Christ is the only instance where God not only speaks to His creation but also seeks to have a personal relationship with them. You don’t get that with the 2 other Abrahamic religions or any other in the world. 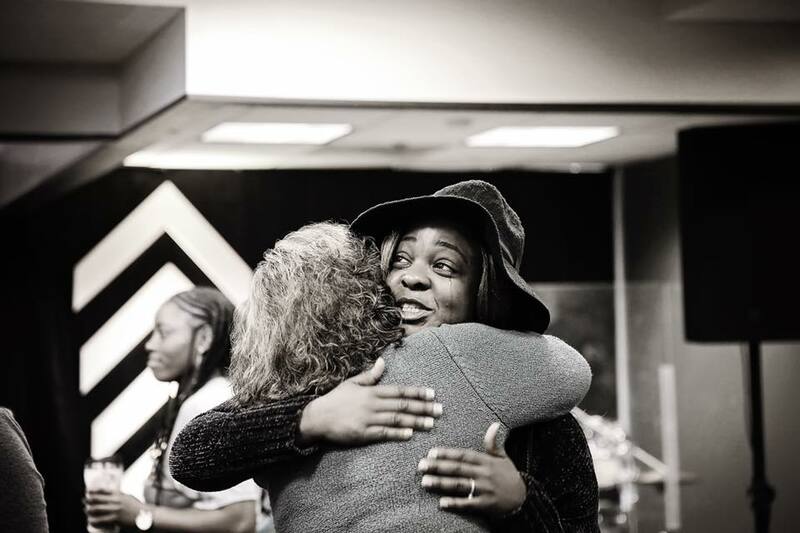 We don’t serve a God at a distance, but One that allows for His Wisdom and Love to be known. Have a Bible question? Want to learn more about What We Believe? Can we pray for you? Contact us.